Can time be actually managed? Ceylon Tea to follow the Kodak saga? A better way to engage the world? Companies heading the right way? 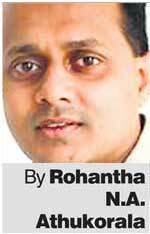 Can SAARC facilitate SL’s hub agenda? Should development banks be more aggressive? Is poverty or governance the cause of terrorism? Launch SL financial hub at CHOGM? Does terrorism actually affect tourist arrivals?